Global Biopesticides Market size was worth over USD 1.8 billion in 2016 and is foreseen to surpass 230 kilo tons by 2024. Rise in crop loss due to insects and diseases, change in farming techniques along with development of pest resistance for several chemicals will fuel global biopesticides market growth. The product is widely used for high quality crop generation for the ever-increasing population and rising organic food demand. Therefore, the industry will observe as a potential business opportunity over the forecasted period. Declining arable land availability due to excessive chemical pest controlling practices is encouraging farming sector towards environment friendly pest management. Chemical pesticides including halogenated, carbamate, and organophosphorus are causing water and land contamination and becoming hazardous to humans. Optimum land utilization, better productivity, and longtime land fertility are key factors fueling biopesticides demand. Organic food industry expansion owing to rising consumer preference for non-synthesized products will alleviate bio inputs demand including biofertilizers, bio stimulants, and biopesticides. Organic food & beverages market is foreseen to generate over USD 300 billion by 2024 with fruits & vegetables being the dominated segment. Rising consumer preference towards organic food along with supportive government initiatives will positively influence biopesticides market growth. U.S. and EU nations are adopting strict approach for chemical imports, with a specific focus to regulate the conventional pesticides residue. As an outcome, these regulations are encouraging industry manufacturers to shift focus towards bio based products. To ensure regular crop exportation to U.S. and EU, various exporting countries are using biopesticides. For instance, Egypt and Tunisia are key importer in Africa due to their high contribution in exporting olives, dates, and palm oil to European countries. Biopesticides product penetration has significantly increased over the past years owing to its efficiency on the crops. Obtained from natural sources including algae, bacteria, fungi, and protozoans, the product is safe and effective substitutes to chemical pesticides. Several associations across the globe are undertaking research and development initiatives aimed at advancing techniques for the expansion and application of these products. Ban on the use of neonicotinoids, paraquat and glyphosate around the world has opened new avenues for biopesticides market growth. Moreover, easy product approval, simpler registrations and low R&D cost are key lucrative factors. The EPA is known to provide simpler registration process combined with need for fewer data, which is formally compiled within a year and compared to three-year tenure of synthetic pesticides. As a result, more firms are projected to take up voluntary step for product portfolio expansion. The industry will face a key challenge in the form of lack of awareness among farmers and consumers. Moreover, frequent product development to avoid immunity building among pests may impact biopesticides market price trend. Bioherbicides market size was worth over USD 100 million in 2016. The product is becoming more popular among farmers due to their long impact up to the next budding season. Increasing organic farming practices accompanied by supportive government models to promote sustainable agriculture has driven the bioherbicides demand. 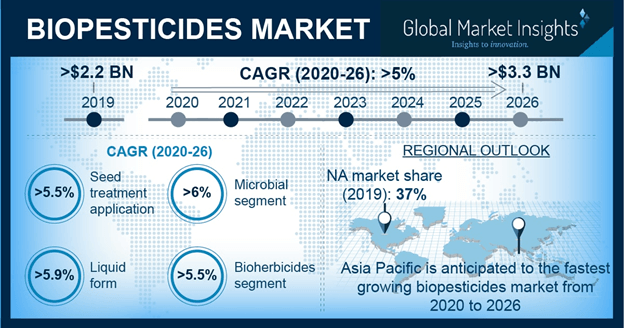 Bioinsectides will witness growth over 6% up to 2024. Rising insect attack levels on crops owing to frequent climatic changes and an increase in demand for organic pest control will result in the bioinsecticides market growth. The product comprises living bacteria, which produce toxins that cause stomach poison among insects and destroy them. Biofungicides are predominately used in leafy vegetables to control a broad range of lepidopteran larvae. Other product include sulfur, oil, moth control, insect repellent, and other biochemical. Seed treatment application generated over USD 130 million business in 2016. Bio-controlled seed treatment is anticipated to rise in popularity owing to its non-toxic nature and high crop yield property. Furthermore, bio-controlled seed treatment delivers additional targeted motives against the desired pests and enhances the nutritional uptake competence of crops. Foliar spray accounted for more than 75% of the industry share in 2016. The rise in the acceptance of biological microbes and enhanced farming technologies have proven to be the key driving factors for the foliar spray applications in the agriculture sector. Widespread research and development events across the world have facilitated the introduction of customized and crop-specific products, which led to the expansion of biopesticides market. Biopesticides market share from fruits & vegetables accounted for over 70% of the overall industry revenue. As many fruits & vegetables are eaten without proper processing, consumers demand for better crop safety processing. Pesticide residue is generally a concern among consumers in these crops than in row crops that are not consumed in raw form. This practice leads to a high increase in pressure on grocery stores and good marketers to offer pesticide-free fruits & vegetables. Grains & oil seeds will observe gains over 6% up to 2024. Oats, vegetables, grains, and oilseeds are majorly contributing crops. The product prevents the generation of pathogens in the yield and enhance crop productivity. Other segment includes pulses, turfs, forage, and greenhouse crops. Liquid formulations can be oil, polymer, and water-based or a combination of these three. Water-based formulations require adding of inert ingredients, which include anti-freeze compounds, surfactants, stabilizers, coloring agents, stickers, and additional nutrients. It can be diluted in water using suspension concentrates, emulsions, capsule suspensions, oil dispersions, and ultra-low volume formulations. The liquid formulation is projected to be the fastest growing market as it provides an increased shelf life as compared with dry formulations. Dry formulations segment is forecast to witness over 5.8% growth owing to its ease-of-usage. Other advantages provided are ready-to-use with no mixing, effective in hard-to-reach indoor areas and at places where moisture from a spray may cause damage, and simple equipment is required for its manufacturing. Microbial source products were worth over USD 950 million in 2016. Bacteria, fungi, protozoa, viruses, and yeast are major microbial source. These are non-pathogenic and non-toxic. Their action is specific to a distinct group of species of pests and they do not affect other living organisms. Residues of microbial pesticides are non-toxic and safe to use in all plantation stages. Biochemical biopesticides are produced naturally or synthetically. It can be categorized into plant growth regulators, insect growth regulators, organic acids, pheromones, minerals, and plant extracts. Other sources include predatory and pheromones. Predatory sources include several organisms, such as fungi, insects, nematodes, bacteria, viruses, and protozoa. North America biopesticides market catered for over 35% of the regional industry share in 2016 Increasing demand for organic food along stringent food safety regulations led the regional industry growth. Europe, dominated Germany and France biopesticides market will witness growth over 6.2% up to 2024. EU countries have introduced national programs for prompting the bio inputs consumption. For instance, France has commenced a program “Ecophyto 2018” with an objective of reducing nearly 50% synthetic pesticides consumption by 2018. Denmark is another country has initiated to the “Green Growth” scheme offering financial help to developers of alternatives plant protection items. Supportive FDI inflows in Africa along with the rising focus on the exportation of grains, dates, olives, and cereals to EU countries will support the product demand. EU’s stringent regulations to promote bio inputs in farming will favor green chemicals’ usage in exporting countries. Egypt and Tunisia hold a substantial place in the African agriculture industry. The availability of limited but fertile land, increased farming education, and focus on exports are the key factors driving growth in these regions. 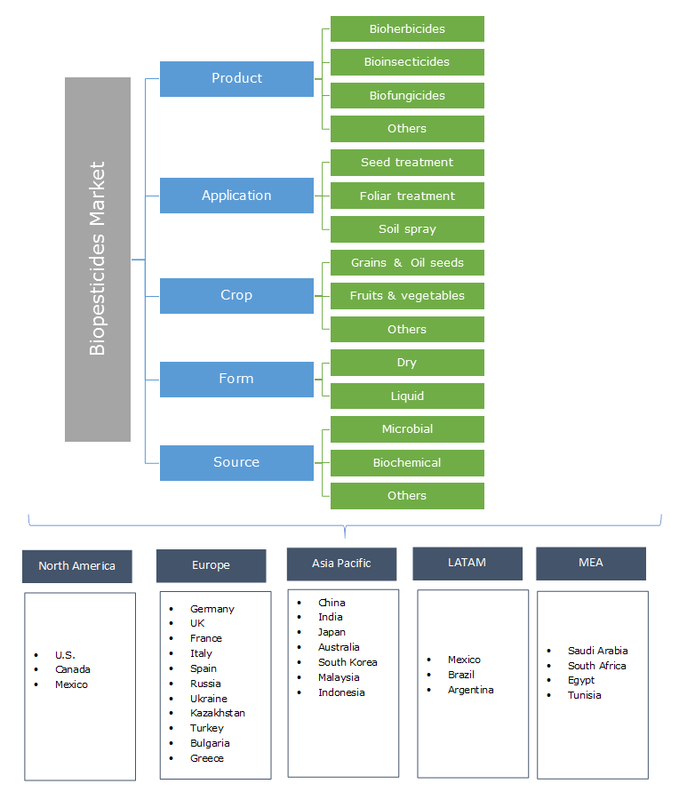 Biopesticides market share is at development stage. Competing with well recognized synthetic pesticides may impose a challenge for small producers in terms of product demonstration and convincing farmers to switch from their tried and tested products. Bayer, Bioworks, Stoller, Syngenta, Dow, ADAMA, BASF, Nufarm, DuPont, Futureco Bioscience, Valent BioSciences, and Koppert are the notable industry participants. Global biopesticides market is significantly leading the organic farming industry through various government models to eradicate the usage of synthetic or chemical pesticides in crop protection is projected to increase product demand. Better human and animal health concerns and growing awareness among the farmers are majorly propelling demand in the overall bio inputs market. Food security regulations and frequent quality checks is also providing growers to effectively adopt the product in theirs farming application.